New stairway is key to modern foyer remodel. — Welcome to Project Guru Designs. The goal was to open the staircase, add a modern vibe and feature the volume ceiling of the entry foyer and adjacent living room. Though the overall color palette for the remodel was in cool grays, punches of color were planned to add life to the project. The new entry door and pendant as well as new distressed flooring would complete the foyer remodel. New stairway: modern horizontal railing, stained wood bannister. 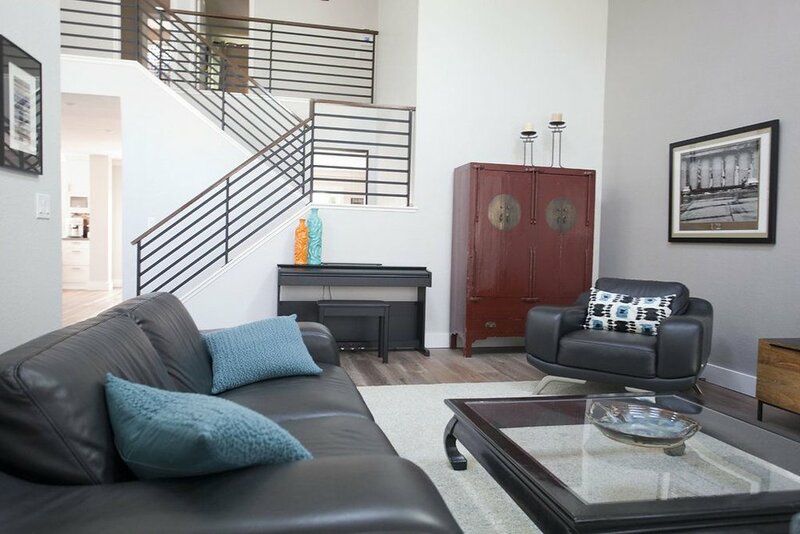 Modernizing an 80's home can seem like an impossible task: rethinking the dated staircase was the key to making this remodel fit the client's esthetic and turn the main living space from dated and drab to light, bright and contemporary. Are you struggling with a design dilemma or a tricky space? Call today to schedule a consultation! We can advise you on everything from a basic room refresh or color choice for your space, to design and implementation of a whole home remodel! Older PostAccent Walls: Designer Secrets for Making Your Home Unique.